In early trading on Tuesday, the Russian ruble climbed 1.7% to trade at 50.76 per dollar after suffering its worst decline on Monday since the 1998 financial crisis. It also firmed by 0.9% this morning to 63.43 versus the euro. Since the beginning of this year, the ruble has fallen by more than a third, as persistent capital flight accelerated following the Ukrainian crisis and the economic sanctions after Russia annexed Crimea. The steady decline in the price of oil, which is now 37% lower than in June 2014, pushed the ruble further down. After draining some of its foreign reserves in a failed attempt to defend its currency, the Central Bank of Russia decided in November to let the ruble float freely. Foreign reserves refers to foreign currency that a country holds in its central bank. 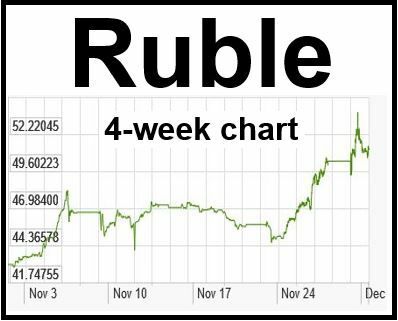 Russia’s central bank’s commitment to let the ruble float freely was tested to the limits on Monday when it crashed to an all-time low of 53.9 to the dollar, its steepest one-day fall since the country defaulted in 1998. The ruble recovered marginally at the end of Monday, sparking speculation that the central bank could stand it no longer and intervened. The recovery is probably also due to a slight gain in the price of oil this morning. Some economists have told the Russian press that they expect oil to fall further and that the ruble will slide to 55 versus the dollar and 68-70 against the euro. The MICEX, a Russian stock index, was 0.1% down this morning at 1,478, while the dollar-based RTS was 2.2% up at 979 points. There are rumors in Moscow that voices close to President Vladimir Putin are calling for capital controls. Some Russian banks have already started placing a $10,000 limit on dollar/euro withdrawals, triggering fears that a major lockdown is starting. Capital controls are measures taken either by a country’s central bank or government to limit how much money flows in or out. Two weeks ago, Premier Dmitry Medvedev ruled out capital controls. “The government, myself, my colleagues and the central bank have repeatedly stated that we are not going to impose any special restrictions on capital flows,” he said. Russian central bank’s deputy governor Ksenia Yudaeva said they are preparing for oil to fall to $60 per barrel. “A long decline is highly probable,” she said.